Globally, there has been an increase in the demand for protein for animal feed. 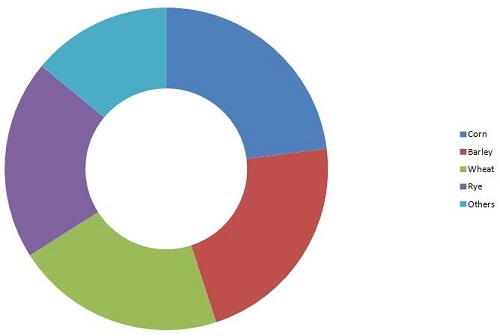 An increase in the average level of income, population rise, and urbanization are some of the drivers triggering the demand in the global gluten feed market. This research report provides in-depth market insight into the global gluten feed industry. Gluten feed is especially popular with producers who are close enough to processing plants to make transportation cost-effective. It is also very palatable and complements low as well as high-quality feeds. This report takes into account the wide range of factors and their influence on the gluten feed market dynamics. The market drivers and restraints are explained in detail in the report, along with growth opportunities. The global gluten feed market is expected to reach a value of $1,055.5 Million by 2019, at a CAGR of 5.4% from 2014 to 2019. The overall market size is estimated by segmenting the market into micro-markets, based on the share of each source, livestock, and geographical region. The market data is available from 2013 to 2019, with a forecasted CAGR from 2014 to 2019. Various secondary sources such as encyclopedias, directories, and databases were used to identify and collect information for this extensive commercial study of the global market. The primary sources experts from related industries and suppliers were interviewed to obtain and verify critical information as well as to assess the future prospects of the gluten feed market. The key players covered in this report include Ingredion Incorporated (U.S.), The Roquette Group (France), Archer Daniels Midland Company (ADM) (U.S.), Cargill Incorporated (U.S.), Tate & Lyle Plc. (U.K.), Bunge Ltd. (U.S.), Grain Processing Corporation (U.S.), Agrana Group (Austria), Commodity Specialists Company (U.S.), and Tereos Syral (France). 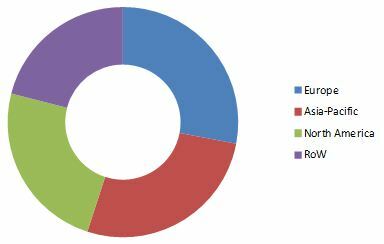 The European segment topped the revenue chart of the global gluten feed market, accounting for around 28% of the total market. The market for gluten feed is expected to grow at a CAGR of 5.4% by 2019, with the highest growth projected to be observed in the Asia-Pacific region. The global market, in terms of value, was dominated by Europe in 2013. Aneconomic rise after the Euro crisis is the key driver that pushed the market forward in this region. The Asia-Pacific region is the second-largest market. North America ranks third, as it is the major exporter of corn gluten feed to other countries and regions. Ingredion Incorporated (U.S), The RoquetteGroup(France), Archer Daniels Midland Company (ADM) (U.S), Cargill Incorporated (U.S.), Tate & Lyle Plc (U.K.), Bunge Ltd. (U.S.), Grain Processing Corporation (U.S.), Agrana Group (Austria), Commodity Specialists Company (U.S.), and TereosSyral (France) are some of the key players in the gluten feed market and their recent development strategies have been studied in detail in this report.